Kayaking really is a thrilling and active outdoor hobby that can both provide excitement and keep you in shape. While you are probably brimming with excitement and angst, getting started with the best beginners fishing kayaks can be a tricky endeavor. Fishing kayaks offer narrow frames that are squirrely at best and using a double-bladed paddle is not something that will come naturally. That being said it probably won’t take long before you realize just how advantageous these little watercraft can be. There are a number of reasons that fishing kayaks are popular and if you are looking to get out there on the open water there is no need to make choosing a beginner’s kayak a difficult process. Sure, there are many things that need to be weighed and consider, but this guide will help narrow the field and have you well on your way. Why Buy A Beginners Fishing Kayak? Is The Sit-On Or Sit-Inside Better For You? The Sundolphin 10-Foot Sit-On-Top Fishing Kayak Journey is an amazing kayak for most types of waters including both rivers and for lakes. This kayak is a great kayak for fishing because it has fishing mounts that feature a swivel rod holder so that you can easily access your fishing rod from either side of the kayak. Not interesting in fishing? This kayak can also be used just to explore the water and to enjoy the fresh water and the waves on the lake or the river. The Sundolphin kayak is made of strong and stable material with both UV-stabilized, patented Fortiflex High-Density Polyethylene, and is both rugged and lightweight so that it can be used outdoors for years to come and is easy to get in and to get off of the water. This kayak offers many features such as three-rod holders, one that swivels, a large seating area that is comfortable and has padded seats that are both adjustable and easy to get in and to exit the kayak. With the size of the cockpit, the Sundolphin is considered one of the easiest kayaks to get in and to exit the kayak, and this can be a safety feature as well. The Sundolphin kayak has storage compartments that can help keep your items clean and dry and also offers a portable accessory carrier that can be used for extra storage and to help carry more of your fishing or water gear. Enjoy your time on the river or lake without worrying if your belongings will get wet or lost. This kayak comes with a cup holder that is located in the middle of the kayak so that you can have a cool drink while enjoying your time fishing, the holder is even big enough to hold a water bottle so there is no limit to the size drink you can bring! There is also a bungee cord area so that the kayaker can take a cooler or other fishing gear for their all-day adventure on the river or the lake. The Sundolphin 10 Foot kayak Journey even comes in two different colors, olive, and sand. This kayak comes with foot braces that are adjustable to fit almost any sized person and also has thigh pads that are comfortable and protected for extra support for long days on the lake or river. The kayak offers a shock cord that allows you to tie the kayak to the deck when not in use. The Sundolphin kayak 10-Foot Sit-On-Top Fishing Kayak has a weight limit of 280 pounds and is 10 foot long. The kayak weighs only 44 pounds so it would be easy for anyone to get in and off of the water. Enjoy your day at the lake or river without having to worry about hauling or carrying an extremely heavy kayak. 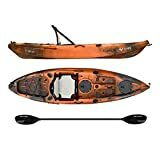 According to Amazon.com the Sundolphin 10-Foot Sit-On-Top Fishing Kayak has a 3.5 of a 5-star review with over 120 personal reviews. Many of the customers loved the kayak for the price, the adjustable foot braces, and the lightweight portability. One customer complemented Sundolphin for creating a fishing kayak that is strong enough to carry him and allows him to take his dog with him. One customer said, “Awesome kayak! Great value for the money. I love going out to cruise and fish. Can’t beat this boat. The 3-rod holders are in the perfect spot. Adjustable foot pegs really help…” -Brian M. 5 stars of a 5-star review. Other customers that gave the Sundolphin a 3 or less star review complained about the kayak being unstable, small, cheaply made, that it fills up with water quickly and that it tips easily. The Ocean Kayak Prowler 13 Angler Fishing Kayak is a kayak that is built to last. This kayak is made to ride waves, to be your fishing guide and even for a leisurely day out with the family. The manufacturer of Ocean Kayak has tested their kayaks from Malibu to the shores of New Zealand to help come up with a kayak that is perfect for all of your water needs! The Ocean Kayak Prowler is an amazing kayak that can help with all of your angling needs. There is a hull that offers plenty of room and gives you all the room that you need to move and to catch the fish that you are wanting to catch. The Ocean Kayak Prowler 13 Angler Fishing Kayak is comfortable, offering a seat that is padded for all-day comfort and for any person that wants to fish in this kayak. The Ocean Kayak Prowler 13 Angler Fishing Kayak offers extra storage with an easy opening hatch that allows you to store your fishing rods below the deck and offers a cup holder that is molded in and a pair of mounted rod holders so that you can use your special rod for each trip. The storage is safe with a hatch that clicks to close, helping to keep your items safe and dry during your big adventure. The Ocean Kayak has many features such as a sit on top design that allows you to get on quickly and off even quicker if needed. It has a safe hull design that is both stable and roomy and has an adjustable seat that is comfortable and adjusts four different ways. This kayak has extra storage that will keep your items safe and dry and includes a cam lock hatch that contains a storage bucket. This storage area can be used to store your cooler, bait, gear, or fishing boxes. The Ocean Prowler is equipped with cup holders and rod holders to make your day of fishing or entertainment both fun and cool, allowing you to enjoy the water and to stay hydrated at the same time! With having paddle holders on both sides of the kayak, it is easy to steer and easy to get where you are wanting to go both fast and effectively, or switch from paddling to fishing in a flash with easy access to both the rods and the paddles. Another amazing feature of the Ocean Kayak is that it is transducer-compatible for those that own fish-finders and are looking for a quick and easy setup. This kayak is built tough, with a fast hull that is quiet and a frame that can handle easy or rough waters. The Ocean Kayak Prowler offers a weight limit of 325 pounds and has a length of 13 feet and 4 inches and weighs only 56 pounds so anyone can handle getting the kayak to and from the water. The best feature about the Ocean Kayak Prowler is that it has a lifetime warranty on the hull. Just call customer service for any reason and they will help make your purchase right! According to Amazon.com, the Ocean Kayak Prowler has a 4.1 out of 5-star review with over 20 people that have reviewed this kayak. Many of the great features discussed include the ample storage, the stability of the kayak, the comfort of the seat and the ease of hauling the kayak. One customer said, “Amazing Kayaks! Have used them in BIG rivers and little rivers, lakes, ponds and everywhere else under the sun…” -John Helland, 5-star review. Trying to find a quality fishing kayak can be a real nightmare these days – but it’s not because there are so few to pick and choose from. The market is pretty well split in half, between “multipurpose” kayak options that cost to nothing but promise the ability to fish from them and incredibly expensive, specialized, and single-purpose fishing kayaks that you won’t find comfortable to use for any other reason out on the water. Finding that “Goldilocks” kayak that splits the difference between price and performance, offering you high-quality fishing results while retaining and easy to control and fun to use kayak can be a tall task. Unless of course, you come across the Vibe Skipjack. Right out of the gate you will be able to see that the Vibe Skipjack kayak has been very specifically designed for fishing out on lakes and in wide, slow-moving rivers – but it retains a lot of the functionality and styling of a recreational kayak, too. At 9 feet long and 32 inches wide it is a very stable kayak. It probably isn’t going to win a lot of flatwater races, and isn’t going to track perfectly because of its relatively stubby length and extra width around the middle – but it’s going to keep you upright when you are casting all day long and still have plenty of capabilities to tear across a lake, pond, or open river without any headache or hassle, either. This isn’t an ultralight kayak or an inflatable option. Coming in at 46 pounds it isn’t going to feel like a brick to carry down to the water, either. 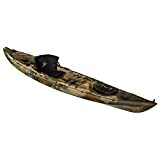 All of the molded in fishing features definitely improve the overall functionality of this kayak when you are serious about spending time on the water as an angler. There are also a number of mounting points for extra accessories and add-ons that extend the functionality of this fishing first kayak, opening up a whole world of opportunity for you to dial things in to your exact specifications. At the end of the day, if you are in the hunt for a serious open water kayak that is going to perform well when you are fishing – but is just as much fun to run when you are hanging out at the lake with a couple of friends – you’re going to want to look no further than everything the Vibe Skipjack brings to the table. It is a top-notch fishing kayak (on lakes, ponds, and wide rivers) but it doesn’t do so well out in truly open water and you probably shouldn’t drop this into an ocean for some saltwater fishing. As long as you recognize the limitations of this fishing/recreational hybrid kayak you’re never going to feel like you got shortchanged but will instead feel like you got two boats for the price of one. All in all, this is a well-made, well-designed, and quality piece of outdoor equipment that you will be able to depend on for years and years to come. It’s the kind of kayak you might land some really special catches from! Before doing anything, you should find precisely why anyone would want to buy a fishing kayak. The truth of the matter is that kayaks are great for many people, but not for everyone. For some people, they’re simply unnecessary. A kayak is not a requirement for anyone. It is a piece of equipment that can be used for entertainment purposes. Nevertheless, the kayak can be used for practical reasons as well. For instance, you can guarantee that you’re going to get a great workout when you ride in a kayak. You’ll be working your upper body a great deal. You’ll also burn off a whole lot of calories. Therefore, anyone who considers themselves to be a fitness freak should definitely buy a kayak and use it regularly. At the same time, a kayak can be a great way to travel. If you need to get downstream as quickly as possible, you should not hesitate to ride in your kayak. It’ll get you there pretty quickly. And of course, you can guarantee that your kayak is going to provide you with tons of fun. As long as you buy a good one that lasts a lifetime, it’ll deliver years and years of fishing excitement. If you visit a state or national park, there is a pretty good chance that you’ll be given the opportunity to rent a kayak. This might be your best option. After all, a lot of people do not use their kayak more than three or four times a year. For other people, buying is wisest. So, which option is going to be right for you? It really depends on your situation and preferences. If you are going to be using your kayak a lot throughout the year, you’ll be better off buying one. After all, the rental costs can add up pretty quickly. If you rent a kayak five or ten times a year, you’re going to be spending a lot of money. You’ll be better off buying one. If you’re only going to be using the kayak once in a blue moon, you’ll be best renting. You should also consider the amount of freedom you prefer. When you rent a kayak, your options are going to be very limited. You’ll probably only be able to kayak at national and state parks. You may want more freedom than this. If you do, you’ll want to buy your own kayak. This will enable you to kayak pretty much anywhere in the world. Just like when you invest in any product, you are going to have to figure out how much you are willing to spend. Have you ever been kayaking before? Do you know that you will absolutely love the hobby? If you have never been before, you might want to consider renting a kayak for a couple of weekends and trying out the sport before you drop a lot of money on something that you will end up never using. Just keep in mind that there are a number of kayaks available on the market and each will offer different features as well as a different price tag. The more you spend, the more you are going to come away with, but it is still possible to find an affordable beginner’s kayak that will provide all the necessary essentials. Believe it or not, kayaks are not all about rapidly speeding down the streams and rivers. In fact, kayaks are extremely popular watercraft for fishing because they are so small and versatile. With these ultra-slim crafts, you can maneuver into sports that much larger fishing boats would not be able to access. Fishing kayaks are specifically made for anglers and they usually come with extra storage space. They will provide enough room for your gear and enough moving room so that you can comfortably cast and reel. If you are going to use the kayak for angling, you want to make sure that you seek one that comes with rod holders and anchors because the slightest riptide or breeze will rock the flimsy craft like crazy. There really is nothing more exciting, unique, and challenging than taking to the rapids. Scattered throughout the globe, you will find that there are a number of rapids that are ranked from beginner to expert. If you are going to use the kayak for these purposes there will literally be no end to the number of destinations available to you. These crafts are specifically made for paddling through rough, fast water and this is exactly what you will need under these conditions. If you live in an area where you have access to whitewater paddling then you will probably want to invest in a dedicated whitewater kayak. Never try to use a recreational kayak for whitewater purposes because this is not only dangerous, but it will not provide a pleasant experience. Recreational kayaks are the most common type of beginner kayak because they are sleek, affordable, and offer a chance to test the waters. These crafts are only made for paddling through gentle rivers, lakes, and less demanding situations. These crafts should never be taken into harsh conditions because they simply aren’t built for this type of demand. The recreational fishing kayak is comfortable and easy to use as well, which are two other features that make it popular amongst beginners. They are capable of a little bit of everything but should be used with caution. Just remember that these kayaks can still be used for other water sports. Touring kayaks are really unique as they are built for several different specific purposes. First, these crafts are boats that are built for long journeys on the water. They usually offer speed and efficiency that will be key when you are on the open waters for long periods of time. When shopping for a kayak for fishing purposes it will be essential to consider the space. You will often be carrying fishing gear and other essentials with you. It will be imperative that the craft offers enough space for you and all your gear. These boats are built sturdy and are capable of handling the rigors of paddling in unique situations that you might find yourself in when you are on the sea. Tandem kayaks are much different than any of the kayaks mentioned above and this is because they are designed for two individuals. That’s right, you can bring along a buddy with the tandem kayak. These boats are usually available if just about any flavor, you just want to make sure you choose one that provides comfortable amounts of room for both individuals. With these crafts, there will usually be two separate cockpits unless you invest in a sit-on-top style, which will later be discussed in this guide. Kayaks have come a long way over the years and the designs have really gotten more and more innovative. You will now find that there are now kayaks available for folding and inflation capabilities. That’s right these crafts can literally be blown up on site. Inflatable kayaks can literally be deflated and carried in a backpack, which is something that will come in extremely handy for people that want to do a little backwoods hiking without worry about their craft getting stolen. However, it should be noted that these crafts are still somewhat heavy when they are deflated, which may be too much of an inconvenience for fishermen. This guide mentioned earlier a little something about sit-in kayaks and sit-on kayaks. Well, it doesn’t matter if you are shopping for a fishing kayak or a tandem kayak, you are going to have to main styles to choose from and this will be the sit-on and the sit-in. Sit-on kayaks are fairly new to the market and they are somewhat trending amongst the kayaking community. The name literally represents what the kayak is. It is a kayak that you will sit-on. Due to the fact that you are sitting on top of the kayak, you will have a lot more wiggle room and space for your gear. These types of kayaks can be perfect for the fisherman due to the extra storage space. Sit-Inside kayaks, on the other hand, are a completely different beast. They will also have a seat just like the sit-on kayak, but it is going to be located deep inside the body of the vessel. There will be foot pedal and pegs so that you can get comfortable and maneuver the boat. With this model, it will feel as if you are enclosed in the cockpit almost like sitting in a plane. The number one advantage to this model is that you are going to have some protection from the elements and the water. Just like every product on the market kayaks are going to come with some advantages and disadvantages. The sit-on and sit-inside kayaks are no different. To start off, the sit-on kayak is probably more beginner friendly because they are easier to get in and out of. Some people don’t like the feeling of being trapped inside an enclosed space. If this is you or you suffer from claustrophobia, you will want to invest in a sit-on kayak. Another big advantage to this style of kayak is that they are self-bailing. This means that any water that splashes onto the deck of the kayak will be drained out through what is known a “scupper holes.” You don’t have to manually drain the water out. Of course, there are some downsides to the sit-on kayak and the biggest downside is that this type of kayak is most suitable for warm weather conditions. Because you won’t have the protection from the water and weather elements these crafts might not be suitable for cooler conditions. However, you do always have the option of a good wet suit. Another downside to these models is that you are going to get wet from the waves splashing and the water dripping off the paddles. The sit-inside kayak is also going to go along with its own advantages and disadvantages. First of all, you have probably already guessed from the paragraph above that the sit-inside kayak will provide more protection from the elements and the water. If you plan on venturing on the water during the cooler weather conditions this will be the style of kayak that you want to invest in. Along with this, due to the unique design, you are going to have a lower profile. The means that it will literally be easier to paddle due to the fact that won’t have to battle as much wind resistance. The lower center of gravity will also provide you with the ability to keep the craft overall more stable. Two of the biggest downside to the sit-inside kayak is that they are more difficult to get in and out of and they are not self-bailing. This means that it will be more of a hassle to mount and dismount. It also means that you are going to have to bail any water that gets inside the craft. This can usually be accomplished by turning the craft upside down when you are on land, but it still an extra process that isn’t required with the sit-on kayak. It should be clarified right now that the sit-on kayak is not better than the sit-inside kayak and the sit-inside kayak is not better than the sit-on kayak. They are both equally created crafts and it really comes down to your specific needs. What do you like better? In addition to this, there are several other factors that you need to consider. Where Are You Kayaking? Are you going to be in calm waters? If so, the sit-on kayak might be ideal for you, but if you are doing to be facing rougher conditions, you will probably want the protection of the sit-inside kayak. Are You Worried About Tipping? Tipping is a real thing with kayaks as they are somewhat squirrely. Sit-inside kayaks are much more stable because of the lower center of gravity that they provide. The only problem is that if the kayak does tip it is going to be much harder to escape from. If these are all things that worry you then you might want to invest in the sit-on kayak. What Weather Conditions Will You Be Facing? If you are going to be using the kayak during the winter or on cool days the sit-inside kayak will without a doubt be the best option for you. The cockpit just offers more protection from the water splash and weather elements. The sit-on kayak really is ideal from warm weather conditions and don’t offer the protection that you need. Buying a kayak is going to be much more difficult than you could ever imagine. If you make the wrong choice, you can pretty much guarantee that you’re going to be disappointed. With that being said, there are a few key characteristics that need to be taken into consideration in advance. Below, you’re going to learn a great deal more about the considerations to take when investing in a new kayak. As mentioned above, the price is important. Nevertheless, you should never skimp on a kayak. If you buy one that is very low in price, you can almost guarantee that it isn’t going to last. It will have many problems and it might even develop a leak in the future. With that being said, you should never hesitate to spend a little bit more. This is the best way to ensure that you’re going to get your money’s worth in the long run. Find out how much you can realistically spend and go from there. Just remember to put more emphasis on the other factors to guarantee that fishermen are going to get the most out of their money in the long run. Remember that it is possible to find kayaks that can actually accommodate multiple people. With that being said, you should consider whether or not you want to ride along with someone else. There are plenty of dual kayaks out there and they’ll work great for fishermen working in teams. Consider all of your options and your preferences. If you do not mind kayaking alone, you will be able to save yourself some money and buy a single person kayak. Otherwise, you should throw more money into the equation and buy yourself a bigger kayak that will be able to support multiple fishermen. Either way, make sure that you choose a kayak that accommodates your unique requirements. Otherwise, you’re going to be disappointed with your investment. When you’re kayak fishing, you’re going to be on top of the water. You just never know what is sitting beneath the surface. Therefore, there is always a risk that your kayak is going to sharp something hard such as a rock. If this happens, there is a real possibility that the rock is going to tear a hole in the kayak and that will create major problems for you. In fact, you might not even make it back to shore. With this in mind, you should choose a kayak that is made from the highest quality materials. This will make a huge difference in the long run and it’ll ensure that your kayak is actually going to last. In the end, your kayak should be lightweight yet durable. This will ensure that your kayak can be hauled around easier but it won’t rip very easily. This is another reason that you should spend more on your kayak. A more expensive fishing kayak will use better materials and that will ensure that it is going to last much longer. At the end of the day, pretty much all fishing kayaks are going to be heavy. It might take two people to move it around. This really depends on the weight of the kayak, your size, and your strength. Of course, some kayaks are going to weigh more than others. This is definitely something that you’ll have to consider when attempting to make the purchase. If you choose a kayak that is too heavy, you’re going to have big problems on your hands. You’ll have a terrible time attempting to get the kayak in and out of the water. Loading it onto your vehicle is going to be even more difficult. This is why you should try to buy a kayak that is pretty light in weight. This will ensure that you’re able to move it around without too much trouble. Make sure that the kayak is durable and lightweight. This combination will make your life so much easier. Plus, it will increase the likelihood that you’ll be able to enjoy your kayak to the fullest in the long run. Another thing to note is that your kayak may come with other items. Some fishing kayaks can be purchased separately, but others are going to include a handful of other accessories. If you’re going to be paying a lot for a kayak, you will definitely want to make sure it comes with everything you need. It is a good idea to get everything you need from the get-go. With this in mind, it is generally a good idea to buy a kayak that includes a vest and oars. This will ensure that you don’t need to buy anything else in the near future. Of course, there is a slight problem here. If you buy everything as a package, there is a pretty good chance that the quality is going to be a little lower. Therefore, it might actually be best to buy everything separately. Either way, you should consider both of your options. This is the best way to get the most out of your money while also ensuring you get everything you need with less of a hassle. It is also imperative to understand that some kayaks are more difficult to use than others. In all likelihood, you haven’t kayaked in a very long time. If this is the case, you’ll probably want to choose a kayak that is going to be easier to use and control. The fishing kayak should keep itself balanced and afloat without too much effort on your behalf. If you have been kayaking for years, you’ll be fine with pretty much any kayak out there. Again, it is pertinent to take your skill level into consideration when attempting to buy a kayak that suits you and your skill level. Before going too far, you need to consider the overall weight limit of the kayak. Remember that a lot of kayaks are capable of supporting two people. Some cannot. Space is important, but the weight limit might be even more vital. When trying to buy a kayak, you need to take your weight into consideration. How much do you weigh? How much does your partner weigh? Can the kayak in question really support the weight? You should never attempt to overload a kayak. Doing so is going to create big problems. It might cause your kayak to sink or become unbalanced. With this in mind, you should take the necessary measurements and go from there. Make sure that your kayak of choice is going to be able to support the weight. Otherwise, you’re going to be throwing your money down the drain. You’ll also want to consider the volume of the kayak. The volume is nothing more than the amount of space inside of the kayak. This is usually referred to in terms of liters or gallons. Be sure to consider the volume of the boat. It could make a real difference in the near future. In all likelihood, you’re going to be kayaking for a long period of time. You’ll probably remain out on the water for hours. After all, you want to get the most out of your kayak. With this in mind, you should definitely consider comfortability of the kayak. How comfortable is the seat? Is it going to provide you with plenty of room to move around? Will you remain comfortable and relaxed throughout the entire kayaking session? If the kayak is uncomfortable, you’re probably going to use it very often. With this in mind, you should certainly choose a fishing kayak that is going to keep you comfortable from start to finish. You should also know that some kayaks feature an additional storage space. They usually hold your items in place using bungee cords of a sort. This is definitely a good thing if you’re going to be away for a long period of time. The storage location can be used to hold a drink and other items. If you want to carry items in your kayak, you will definitely want to choose one that contains storage space. It might seem like a minor perk, but it’ll prove to be very beneficial in the long run. When it comes down to it, a lot of bad products are manufactured outside of the United States. Some countries like Canada, the United Kingdom, and Germany make some awesome products. However, there are some countries that make products that are horrible. If you want to make sure that you’re spending your money wisely, you need to pay close attention to the country of origin. It is best to choose a kayak that has been designed and manufactured in the United States. You’ll probably end up spending a little bit more in the long run, but it’ll be worth it. After all, this will ensure that your kayak is long-lasting, tough, reliable, and rugged. This is the best way to put your mind at ease and guarantee that you’ve made the right choice. There is a good chance that you’ll want to stop your kayak at some point. This is true for fishermen who want a snack and those who intend to fish from their kayak. With that being said, you’re going to need a good anchor. Consider buying a kayak that actually comes with the anchor. This will take the guesswork out of the equation and save you a lot of time and money in the long run. Just make sure that the anchor is reliable and worth it. Are you going to be fishing while kayaking? This is really one of the very best ways to spend your time and energy. Just remember that not all kayaks are equipped for this specific purpose. Some are better here than others. If you want to fish from your kayak, you’ll want to buy one that is equipped with a rod holder or two. This will make a real difference. It’ll ensure that your rod is going to remain in place at all times. Even when you’re sitting back and relaxing, your rod will not go anywhere. The rod holder will keep it steady so you can focus on other things going on nearby. Before going too far, you need to find out how you’re going to be using the kayak. Do you want to use it for fishing? Or, do you just need to get from one location to the next? If you’re an adrenaline junkie and you want to have a really good time, you should think about buying a fast kayak. Remember that some are going to be much slower than others. There are numerous factors that play a role in determining how fast the kayak is going to travel. If you want one that is quick, you need to ensure that all of the characteristics are correct. Otherwise, you’ll only be able to trudge along and that will get very annoying for you. It is undoubtedly true that you’re going to be hauling your kayak from one location to the next. After all, most fishermen are not fortunate enough to live near water. If you fit into this category, you need to make sure that you’re going to be able to transport your kayak without too much trouble. Some kayaks are inflatable. This is definitely a good thing for fishermen with limited space. It’ll ensure that you’re able to deflate the kayak when you need to move it from one place to another. Just remember that inflatable kayaks are not as tough and rugged as the competition. Therefore, it might not be worth it. You might be better off buying a better kayak as long as you have the means to move it around. You’ll probably need to strap it to the hood of your automobile. That might seem like a hassle, but it’ll pay off in the long run. Remember that you’re going to be moving your kayak around a lot. If it is not easy to move, you’re going to have trouble on your hands and this is something that you want to avoid. Make sure that your kayak of choice is equipped with several carry handles. This will make things so much easier. It’ll give you a safe and comfortable way to haul the kayak from your vehicle to the water’s edge and back. It is best to have at least two handles to ensure that the kayak can be carried by two fishermen. When it comes down to it, appearance isn’t all that important. Nevertheless, a lot of consumers are picky. If you fit into this category, you will definitely want to pay close attention to the kayak’s appearance. This isn’t going to impact the kayak’s performance. However, it could make a big difference to you. After all, you’ll want to make sure that your kayak looks great. If you want to kayak around with a little more flare, you should definitely buy one that looks cool. If you’re worried more about performance and usability, you don’t have to worry too much about the appearance. You might be interested in kayaking for the very first time. Just remember that kayak is a little more difficult than it looks. If you do not get it right, there is a good chance that you’re going to end up getting soaked. Therefore, you need to choose a stable kayak that isn’t going to flip over on you. Thankfully, there are some kayaks that are going to remain afloat on their own. It is definitely in your best interest to buy one of these models. It’ll ensure that your kayak will remain upright without much effort on your end. Read reviews as much as possible to ensure that your kayak is going to be great for all skill levels. It is absolutely essential to make sure that your investment is going to be worth it. The best way to do this is to ensure that your kayak is going to last a lifetime. If it doesn’t, you need to know that the problem can be remedied as quickly and conveniently as possible. This is why you should invest in a kayak that is equipped with a good warranty. That will provide you with greater reassurance and peace of mind. Also, you need to consider the company in question. Are they trustworthy and reliable? If not, you’re probably not going to be able to get problems fixed quickly. Take both of these factors into consideration before moving forward. It will ensure that your investment is going to be a wise one for many years to come. Some companies will offer a 1-year warranty. This is good, but it probably isn’t enough for most fishermen. Be sure to look around a little bit more to get a much longer warranty. In the future, there is a pretty good chance that you’ll be glad that you did. At the end of the day, the market is oversaturated with amazing kayaks. Just remember that not all of them are amazing. Some are going to perform better and last longer than the competition. Therefore, you should consider all of your options in advance. Make sure that you’re aware of the products that will actually be worth it. You will need to put in the research, time and effort to get it right. Using this guide will make a big difference. Be sure to use the information provided here to guide you in the right direction.